Over the coming days, a number of People's Assemblies against Austerity are set to take place across the UK. Author and Academic Andreas Bieler, who will be speaking at the Nottingham Assembly this Saturday alongside Tony Benn, Owen Jones and others, explains their urgent necessity. The public sector in the UK is under attack across the board: tuition fees and marketisation in Higher Education, the abolition of the Education Maintenance Allowance in Further Education, moves towards privatising parts of the NHS, cuts in disability benefits, the list could go on. Since 1 April this year, a second round of draconian cuts have been implemented damaging especially the weakest members of society (for an overview, see BBC News, 15 April 2013). And yet, resistance is fragmented and weak. 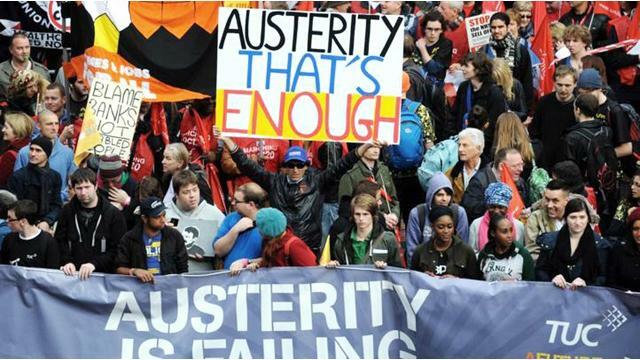 A coherent, united movement against austerity has not emerged in the UK. On 18 May 2013, a People’s Assembly Against Austerity is going to be held in Nottingham. In the context of the collapse of national resistance and the importance of a broad space to bring together diverse groups, this could be a major step towards the revival of the fightback against austerity in the UK. The public sector-wide strike on November 30, 2011 was a major success. Thirty trade unions had coordinated strike action and brought the country to a standstill. Nevertheless, it was not followed up with further joint activities. Shortly afterwards, some unions negotiated separate deals with the government, others continued to strike, and still others hesitated over which line to take. November 30 turned out to be a one-off event without consequences. TUC members have demanded for some time a call for a general strike, but this has not been acted upon by trade union leaders. In a way, it is almost as if trade unions at the national level have given up the struggle against austerity. They certainly do not provide the kind of leadership that is necessary for a successful campaign. Instead, the hope and focus now seems to be on the return of Labour to power in 2015, even though trade union leaders are fully aware that many of the current cuts and changes were initiated by the previous Labour governments. We might complain about this lethargy at the national level, but People’s Assemblies might actually be able to overcome its manifestations at the local level. Second, opposition to austerity is highly fragmented. Often it is only disagreement with the current government which brings together various groups. At the same time, there are regular tensions over whether to accept Labour Party members within the broader resistance movement. After all, have previous New Labour governments not laid the ground for many initiatives of restructuring, implemented now by the coalition government? While there may be some truth in such sentiments, it would be foolish at the same time to reject any forces willing to oppose austerity. People’s Assemblies can provide the space where different movements and different people can come together and – despite tensions between them over the Labour Party’s record in government – work together in resisting the attacks on the welfare state. Moreover, it is at the local level that cuts are most felt. The closure of a hospital or a public library, the transformation of local schools into academies, the restructuring of GP surgeries – these are all changes affecting people directly in their day-to-day lives. Unsurprisingly it is also at the local level that people are most likely prepared to become involved in activities of resistance. People’s Assemblies can provide the vehicle to energise these people. Finally, local and regional People’s Assemblies can provide the forum for the co-ordination of the already existing movements against austerity. Importantly, local initiatives to defend the NHS, against the introduction of Academies or against cuts to disability allowances already exist in many parts of the country. Frequently, however, they are single-issue initiatives. This plays into the hands of government, which attacks one individual sector after the other. Local People’s Assemblies can provide the space for these individual initiatives to compare their analyses and to prepare joint activities. After all, austerity is behind the attacks on all the various areas of the public sector and while individual government policies may differ significantly, the underlying rationale is the same. Ever larger parts of the public sector are restructured and opened up to private capital. Local People’s Assemblies provide the opportunity to bring these individual initiatives together into one more coherent voice of opposition, able to contest austerity successfully. Of course, local People’s Assemblies in themselves will not solve the problem. National co-ordination is required to fight back at the level of government. Local People’s Assemblies can, however, provide the necessary pressure on national trade union leaders to spring into action and provide the leadership against austerity this country and its people deserve. Andreas Bieler is Professor of Political Economy at the University of Nottingham. His most recent book, Global Restructuring, Labour and the Challenges for Transnational Solidarity, was published by Routledge. His website is http://andreasbieler.net. A really good article summing up the problems with the anti-austerity movement and why these problems arise. Hopefully, People’s Assemblies can become a driving force behind the anti-austerity movement; the best bit about them being that they bring people together under one roof, ignorant of party political ties.